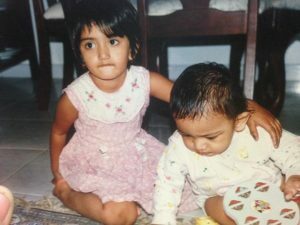 On Fragile X Awareness Day, Avanti Balachander,18 shares her insights of living with her brother who has Fragile X and ADHD. And her three wishes. 16 years ago my brother was born. 14 years ago he was diagnosed with Fragile X and ADHD. I would like to say it was all dandy. And that once we knew what the issue was we could work on it. But man it was difficult. No one knew anything about Fragile X back then, we had to figure it out as we went. We were so lucky Dhruv was even verbal so he could tell us if he was facing any discomfort. He was a smart kid. But not smart enough for his age. Or smart like how he should have been. He couldn’t put the square block in the square peg, but he could con his way out of Occupational Therapy classes by asking for a water break, then a food break and then saying he was tired. He has severe social anxiety, (something that we only recognized recently), and would refuse to go out, and when we forced him to do something he would lash out and hurt us and then hurt himself by either biting his hand or forming a fist. Yes it’s a rough ride, but there are so many perks. Dhruv will love you unconditionally. He doesn’t see you as a being of mistakes and flaws and judge you for it. I am his sister and that is all. I am the person who will watch Barney with him and put on Youtube for him. I am the person who will connect his iPad to the wifi. I am the person who will take selfies with him. I am the person who will take him for drives. I am the person who sleeps in the room with the books. I am his sister and he loves me only for that. For that, I am ever grateful to have a person in my life that will never judge me for my decisions. He may not comprehend the complexity of a lot of them (even as something as simple as getting a tattoo) but he will never shun me for that. 1. Today, the 22nd of July is Fragile-X awareness day. I urge all of you to read a little about this disorder and the children it affects. Here is a short video that helps you get started: Understanding Fragile X. Along side this please also read about other disorders such asAutism, Cerebral Palsy and Down’s Syndrome. 2. I’d like to add that these kids aren’t aliens. Staring at them because of how they look, their actions (drooling, hand flapping, yelling) makes it difficult not only for them but for the family as well. So the next time you see a child acting up in public who you suspect is mentally disabled, do your bit and avert your eyes and just keep walking on. Better still, go say hello. 3. An important note to mention is, these children are very much capable of having agency. They WILL become adults one day. The ultimate goal is to make them as self sufficient as possible and not to make them complacent by making other people (such as parents/ caregivers) do things for them. It’s not possible in all cases, but it is what everyone works towards. Avanti Balachander is a second year law student at OP Jindal Global University. She is an inter-univ basketball player. She has interned with MAD and The Banyan at Chennai. She writes poetry. This piece was originally shared by Avanti as a facebook post.